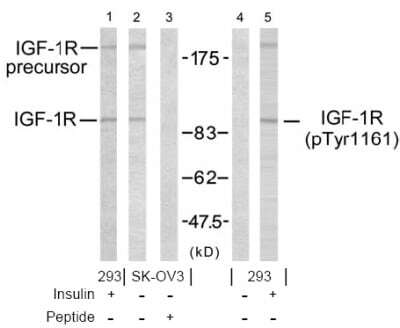 This antibody detects endogenous levels of total IGF1 Receptor protein. Crossreacts with insulin receptor (P06213) and insulin receptor related protein (P14616). The antiserum was produced against synthesized non phosphopeptide derived from human IGF1 Receptor around the phosphorylation site of tyrosine1161. 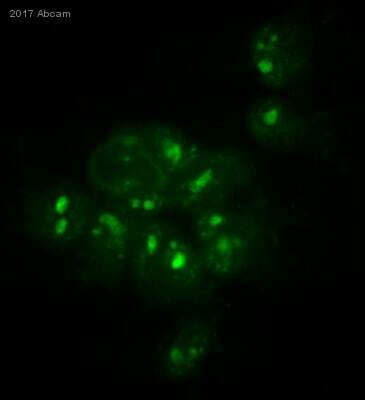 WB: HEK-293 and SK-OV3 cells treated with 10 mU/ml insulin. 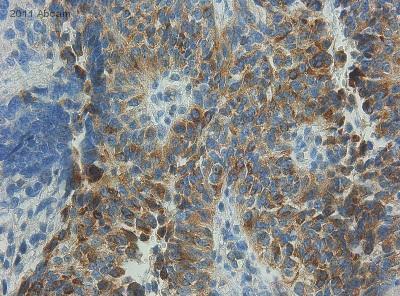 IHC: Human breast carcinoma and brain tumor tissues. Our Abpromise guarantee covers the use of ab39675 in the following tested applications. WB 1/500 - 1/1000. Predicted molecular weight: 155 kDa. Paraffin-embedded human brain tumor (Ependymoma) tissue stained for IGF1 Receptor using ab39675 at 1/50 dilution in immunohistochemical analysis. Western blot analysis using IGF1 Receptor antibody (ab39675, Lane 1, 2 and 3) and IGF1 Receptor (phospho-Tyr1161) antibody (ab39398, Lane 4 and 5). Lane 1 and 5 treated with insulin (10mU/ml). Paraffin-embedded human breast carcinoma tissue stained for IGF1 Receptor using ab39675 at 1/50 dilution in immunohistochemical analysis. Publishing research using ab39675? Please let us know so that we can cite the reference in this datasheet.